Wild Camargue horses wander freely in the Parc Naturel Regional de Camargue of the Provence in France, Europe. Camargue horses are an ancient breed found in the Camargue area of the Provence, France where they run wild in the marshes and develop great stamina and hardiness. Camargue horses also have an extremely calm temperament and can move very quickly and easily which has resulted in some of these horses being used for equestrian games, dressage and long distance riding.In Provence, France Camargue horses are considered a small species of horse but are still extremely strong being able to carry adult men on their backs. When Camargue horses are born they are either black or dark brown in color and as they mature to adulthood their coat lightens up and changes into a pale grey or white.The Camargue in Provence, France is a very captivating place to visit while on your European vacation and you will find plenty of wildlife and plant species across this amazing countryside. Camargue Horses and foal, Equus caballus, in Plaine de la Camargue, Parc Naturel Regional de Camargue, Camargue, Bouches du Rhone, Provence, France, Europe. 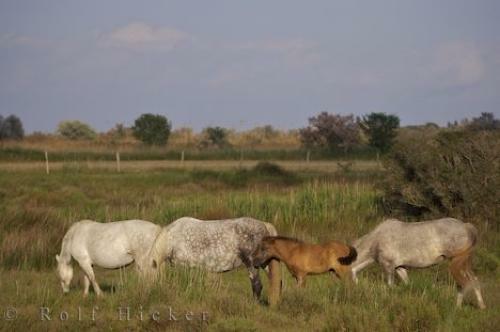 Photo of a Camargue foal with three adult horses roaming the fields in Provence, France in Europe.